I have always loved creating stories. What started out as recalling crazy dreams I would then tell as bedtime stories for my little siblings eventually evolved into writing my own books as a child and teenager. After sharing with family and friends, I’ve been encouraged to publish my own books and pursue what I’ve always wanted to be: a writer. Some of you may be thinking, ‘I want to be a writer! I want to write fiction and regaling tales that are overflowing in my imagination and waiting to be written down on paper. But where do I start? 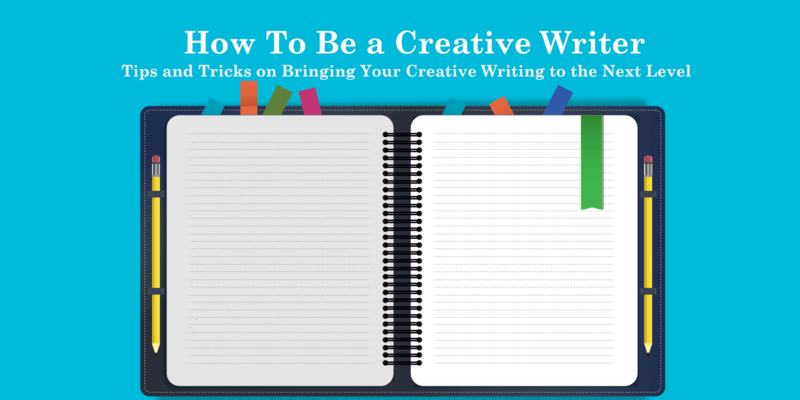 How do I become a creative writer?’ Well here I’m going to help you with some tips that I’ve learned over the years from mentors and tricks that I’ve learned myself that has helped me get those “creative juices” flowing. Write everyday, about anything, or any time an idea comes up. The only way your writing gets better is if you’re writing more and more. And the only way those ideas can become anything but something floating in your head is to write it down. As the age old saying goes, practice makes perfect. How to do this: Start by writing about your day, your feelings, what you had for breakfast. Either way write something down. This is simply practice. Use this time to jot down anything that come to mind for about 30 mins or longer. What may have started as you writing about your feelings may turn into something more. The act of writing has to be exercised like muscles; you get stronger the more you practice, and it gets easier as time goes on. These little exercises are like a warm up. You can use these sessions as prompts and create a story or a narrative from practically nothing. It will tune your brain to find a creative story in anything. If you can’t find anything to write about, you can always use prompts from the internet. So many websites these days offer prompts as a way to inspire the creative flow of a writer like you or myself. Everyone sees things differently. So even if we use the same prompt, more than likely you’ll get two different stories. The goal of getting better at writing is to find your own voice and offer your own perspective. Read EVERYTHING! Books, magazines, recipes, either way you need to read. The best thing you can read are books or items that are similar to what you want to be writing. Learn from your favorite authors by reading their work. It’s like taking a class on writing led by your favorite author through your favorite story. Want to learn how to describe worlds off in other dimensions that are in the depths of your imagination? Read a fantasy or sci-fi book. Want to understand how to get a reader biting their nails in anticipation and worry while reading about the lives of your characters? Read a thriller or mystery. Books and stories aren’t just great to read, but a wonderful source of education as to how a story has been written. If your favorite books are doing well and have claimed the hearts of it’s fans as well as your own, that author must have known what they were doing. You want to be like them, but make sure not to copy their style. You want to find your own writing style. People won’t like your writing if you’re simply a carbon copy of someone else. To gain to favor of your readers, you need to stand out as your own writer using your own voice. This is the most helpful tip I have learned. Ever have a great idea but nothing to write it down with? I do all of the time, and it’s annoying to finally find a pen and paper and not remember anything of what you wanted to write down. Having a journal solves that. At any place and time, inspiration might strike you, and you want to be prepared to catch that electricity in a bottle in a manner of speaking. There have been times where I have written them on napkins, envelopes, even old receipts. I used to stuff them in my journal for later to come back to when I needed inspiration again. My own trick to this is something you probably have on you at all times: your smartphone. With all of the capabilities it has, there’s almost no reason you should be without a way to write down ideas before they get away from you. Apps for notepads, voice recordings, even simple camera app can capture a moment that can inspire a whole series that you’ll be able to come back to because you captured it. Just like written prompts, photos can inspire a scene, and setting, and even characters. As a child in school, I was given assignments that were photo prompts, and I hated them. They were timed, and never allowed the proper setting for me to write a great story. But now as an adult, photos are a great way to gain inspiration. Look at a picture, and write down what you see and the story behind it. This is a great way to prompt a story if you feel like a written prompt is too limiting. A photo is just that, a picture. And a picture is worth a thousand words. You just have to find your thousand, and make it into something beautiful. Just like with reading all of the time and taking guide from prompts, different types of media can conjure up inspiration you never knew you needed. And just like using other books to study how to write, studying other media that also tells a story is very beneficial as well. Take watching a movie adapted from a book for instance. It almost always is never exactly that same as its counterpart, but it’s definitely a different way to see and tell the story. To say that I was a shy kid is an understatement. I’ve still introverted now. But the only way to gain feedback from your work and know if someone else will enjoy your writing is to let someone read it. Too many times do I feel subconscious of what I write to the point where I don’t feel comfortable letting it grace the eyes of others. The only way to know if you’re getting better is to let someone read your writing. Positive and negative feedback helps you grow as a writer. I am a creative writer and a travel junkie. I love telling stories, and want to travel the world and tell the stories of others as well as my own. You can join me on my journey to do just that here on my website. I talk about travel, finding your passion, and using it to live a life the way you want to.